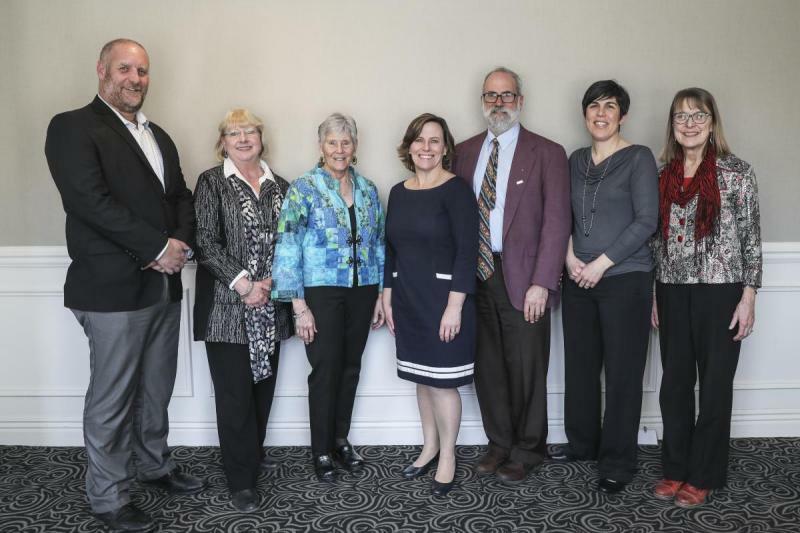 The 2019 Nonprofit Impact Awards were presented by the NH Center for Nonprofits to Jane Difley, Julie McConnell, Laurie Harding, NAMI New Hampshire, Krempels Center, and SOS Recovery Community Organization on April 4th at the annual Nonprofit Impact Celebration held to recognize the impact of the nonprofit sector in New Hampshire. The awards are presented each year to honor remarkable people and nonprofit organizations that have made outstanding contributions to their communities. Some 180 guests gathered at the Manchester Country Club in Bedford to celebrate the award recipients and the nonprofit sector overall. Themes of hope, collaboration, and creating change were present throughout the evening in the award tributes and comments from the honorees. Jane Difley and Julie McConnell received New Hampshire Impact Awards recognizing their significant contributions to the nonprofit sector and the state. Jane Difley, President and Forester at the Society for the Protection of New Hampshire Forests, was honored for her leadership increasing the pace of land conservation in the state. Julie McConnell, Director of Child Care and Community Facilities Lending at the New Hampshire Community Loan Fund, was recognized for her significant impact on early childhood education in the state as an advocate, lender, trainer, and mentor. Laurie Harding, Board President of Headrest received the Board Impact Award for her exemplary board service and leadership on public health issues. NAMI New Hampshire (National Alliance on Mental Illness) and Krempels Center received Nonprofit Impact Awards, recognizing exceptional service to the community. NAMI New Hampshire was lauded for its commitment to improving the lives of all people affected by mental illness and suicide through support, education and advocacy. Ken Norton, Executive Director, accepted the award. Krempels Center was honored for its innovative and collaborative approach to addressing the complex and unique needs of brain injury survivors in New Hampshire. Lisa Couture, Executive Director, accepted the award. The Harvard Pilgrim Healthy Community Impact Award was presented by Dr. William Brewster to SOS Recovery Community Organization for its dedication to eliminating barriers to recovery services. As the first recovery community organization in Strafford County, SOS provides the peer-based addiction recovery supports that people need to help them live their lives without drugs or alcohol. John Burns, Executive Director, accepted the award. The evening was made possible through the generous support of Harvard Pilgrim Health Care, Eastern Bank, E&S Insurance Services, and others.